Scheduled originally for D plus 1, the attack was postponed a day in the hope that additional time might drain some German strength from the salient to the front of the XIX Corps. As events developed, the delay prompted no shift of German troops actually in the line, but it did encourage the movement of part of the Army Group B reserve, the 15th Panzer Grenadier Division, to a point from which it might engage the XIX Corps.2 This did not negate use of the panzer grenadiers in the vicinity of Geilenkirchen, though it did delay their employment there. kirchen-Muenchen-Gladbach railroad follows the valley for several miles past Geilenkirchen before veering eastward at the village of Wuerm. Having assumed control of the seventeen-mile sector from the Maas River to the vicinity of Geilenkirchen, General Horrocks’ 30 British Corps had positioned the 43d Infantry Division northwest of Geilenkirchen. South and southeast of the town, between Geilenkirchen and the left flank of the XIX Corps, a regiment of the 102d Division, the 405th Infantry, held a narrow sector which at this time was the only front-line responsibility of the XIII U.S. Corps. Labeled Operation CLIPPER, the fight to eliminate the Geilenkirchen salient was to develop in four phases. Attached for operations to the British but still tied for other purposes to the XIII Corps, the 84th Division was to make the main effort by passing through the 102d Division’s narrow sector in early morning of the first day, 18 November, two days after the start of the Roer River offensive. Using but one regiment at first, the 84th Division was to take high ground east of Geilenkirchen and about Prummern, two miles to the northeast. Taking all these objectives would eliminate the German wedge between the British and Americans. The front line then would describe a broad arc from the Maas River near Maasbracht, southwest of Roermond, to the Wurm River at the trio villages, thence southeast to Gereonsweiler. The final boundary between the XIII and the 30 Corps (and thus between Second British and Ninth U.S. Armies and the 12th and 21 Army Groups) was to follow generally the course of the Wurm to the villages, thence northeastward along the Aachen-Muenchen-Gladbach railroad. No immediate British participation, once Operation CLIPPER had been concluded, was planned, though the 30 Corps did contemplate a later local advance along the west bank of the Wurm to high ground overlooking Heinsberg, seven miles north of Geilenkirchen near the confluence of the Wurm and the Roer. The British intended eventually to drive either southeast from Nijmegen or northward from Nijmegen, but extensive preparation and reorganization were necessary before the drive could be undertaken. 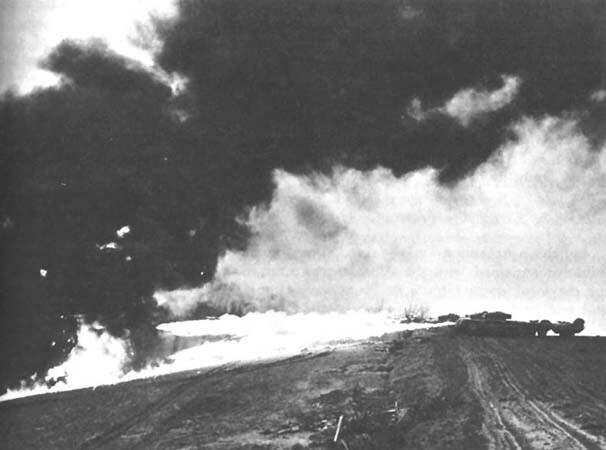 Other than Operation CLIPPER, the only British offensive action coincident with the November offensive was the continuing drive to clear the Peel Marshes west of the Maas River. As events developed, the fact that no large-scale offensive was launched by the British—not even a large-scale feint—worked to the detriment of the November offensive. It enabled the Germans to shift divisions from the front of the 21 Army Group to oppose the First and Ninth U.S. Armies. Subsequent events were to demonstrate even more clearly that the offensive was confined primarily to the American part of the front. During the course of the fighting west of the Roer, the Germans were to move from Holland to active participation against the U.S. armies not only the 10th SS Panzer Division but also the 3d Parachute Division and an infantry and a volks grenadier division. As to the immediate situation at Geilenkirchen on the eve of the 30 Corps attack, the German line-up was the same as it had been two days before when the November offensive began. Both Colonel Landau’s 176th Division, northwest of Geilenkirchen, and General Lange’s 183d Volks Grenadier Division, in and southeast of the town, had concentrated their greatest strength about Geilenkirchen. Here also General Blumentritt, commander of the XII SS Corps, had emplaced the bulk of his artillery. In addition to artillery support to be expected from the 30 Corps, the 84th Division was reinforced by two U.S. battalions attached from the XIII Corps. Because position areas in the congested sector between the Maas and the Wurm were at a premium, four other artillery battalions available in XIII Corps were not to participate. 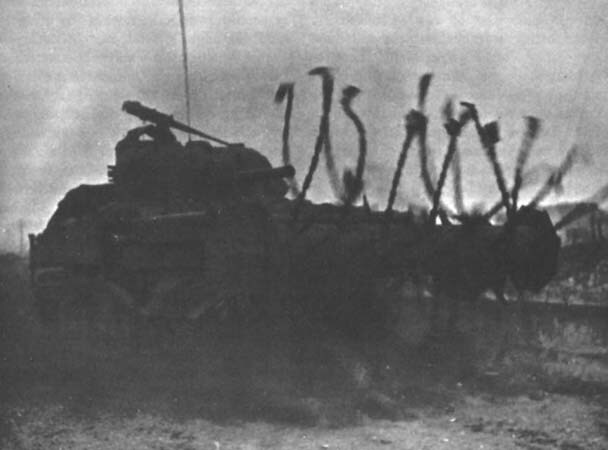 BRITISH FLAIL TANK beating the road to explode mines. tanks for piercing the mine field was limited, the division commander, Brig. Gen. Alexander R. Bolling, decided to use only one, regiment at first. The 334th Infantry under Col. John S. Roosma was to capture high ground east of Geilenkirchen and at Prummern, whereupon on the second day, the 333d Infantry was to attack Geilenkirchen and proceed up the Wurm valley to Sueggerath. Both regiments presumably would combine for the final push into the trio of Wurm villages, Muellendorf, Wuerm, and Beeck. As British searchlights provided hazy illumination across the fields between Geilenkirchen and Immendorf, the flail tanks of Drewforce at 0600 on 18 November churned toward the German mine field. Because mud gummed the flail chains and lessened their effectiveness, engineers checked behind the tanks with mine detectors. Only desultory German fire interfered. An hour later, after a sharp five-minute artillery preparation, two battalions of the 334th Infantry began moving through the two gaps in the mine field. Concealed by the fading darkness, neither unit encountered accurate fire while passing through the gaps. On the west, attached British tanks could not accompany the advance at first because of deep mud, but the 2d Battalion nevertheless plodded ahead through use of marching fire and small unit maneuver. By midmorning the battalion had gained the high ground east of Geilenkirchen. On the regiment’s right wing, the 1st Battalion was held up for a while along the spur railroad by a cluster of ten pillboxes, an intermediate objective en route to Prummern. The battalion commander, Lt. Col. Lloyd H. Gomes, moved among his platoon leaders encouraging them to urge their men forward. Once the men had overcome the temptation to court the protection of the railroad embankment, they used marching fire to advantage. When they had driven the Germans from trenches into the pillboxes, they discovered as had others before them that this was three fourths of the battle. To relieve the 84th Division of some concern, the XIII Corps commander, General Gillem, alerted two regiments of the 102d Division for possible commitment in event of a German blow.13 When by midday the Germans had not struck, the 334th Infantry resumed the attack in the direction of Prummern. The 2d Battalion on the right aimed at the village, while the 1st Battalion moved toward Hill 101, west of the village. On the opposite side of Geilenkirchen and the Wurm River, the- 43d British Division had attacked about noon on 18 November. By the end of the day the British controlled Tripsrath and most of Bauchem, north and west of Geilenkirchen. The day’s advances on both banks of the Wurm obviously had taken the starch out of the hard tip of the Geilenkirchen salient. Allied forces now looked down upon the town from three sides. Out of context, this order must have been hard to understand; for as night approached, both battalions had incurred the disorganization inherent in a day of fighting, and the men were cold, muddy, and hungry. Yet, in the over-all pattern, taking advantage of the momentum of the day’s advance to get these additional objectives before pausing made sense. The 30 Corps commander, General Horrocks, had directed during the afternoon that the 84th Division the next day combine the third and fourth phases of Operation CLIPPER. On 19 November the 84th Division was to take Geilenkirchen and Sueggerath and, on the same day, the trio of villages Muellendorf, Wuerm, and Beeck.16 Holding the tip of Hill 101 overlooking Sueggerath obviously would facilitate, advance of the 333d Infantry into Sueggerath and beyond against Muellendorf and Wuerm. Occupying Mahogany Hill would provide the 334th Infantry high ground between Prummern and Beeck that would improve the defense of Prummern and at the same time assist materially an attack upon Beeck. As night fell on 18 November, the attached British searchlight battery moved forward. The attack continued. 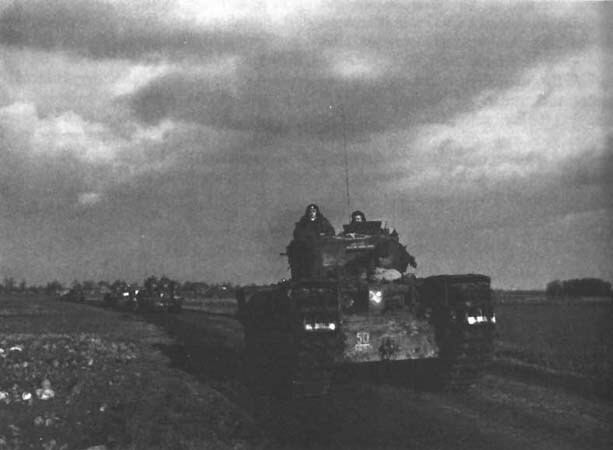 COLUMN OF BRITISH CHURCHILL TANKS on a road near Geilenkirchen. 2d Battalion could not get an attack started against Mahogany Hill. Men of Colonel Gomes’ battalion were too involved still with eliminating points of resistance within the village. Only a reconnaissance patrol moved toward Mahogany Hill during the night. Returning two hours after midnight, the patrol brought back disturbing news. The men had spotted six German tanks moving against Prummern from the north. The blow that followed was delivered by an estimated two companies of the 9th Panzer Division’s 10th Panzer Grenadier Regiment, plus six tanks.17 Though the situation never reached critical proportions, the men in Prummern had their hands full the rest of the night and into the next day. The result was that no attack could be mounted against Mahogany Hill until an hour before noon the next day, 19 November, when Colonel Roosma committed his reserve battalion to the task. Fire from three pillboxes atop the hill, from two pillboxes at a crossroads in the northeastern fringe of Prummern, and from field fortifications on the eastern edge of the village stymied this attack. For another day Mahogany Hill remained somewhat aloof from the fighting while the Americans tried to eliminate the last resistance from the fringes of Prummern. BRITISH FLAME-THROWING CROCODILE (MK-7) TANKS in action. This they finally accomplished late on 20 November with the help of flame-throwing British Crocodile tanks, used against the pillboxes at the crossroads. Mahogany Hill itself was to fall two days later after only a token engagement as a company caught the Germans atop the hill by surprise. As this precaution was taken, the initiative remained with the Allies except for the local counterattack at Prummern and one or two minor forays out of the Wurm valley against the British. Expected commitment of the 15th Panzer Grenadier Division against the XIII Corps still had not developed. On 19 November the 84th Division’s second regiment, the 333d Infantry, launched another phase of Operation CLIPPER at Geilenkirchen amid an aura of success. Advancing up the Wurm valley to seize successively Geilenkirchen, Sueggerath, Muellendorf, and Wuerm, the 333d Infantry discovered early on 19 November that Geilenkirchen was not the Gibraltar it was supposed to be. Already encompassed on three sides, the Germans in the town provided little more than a stiff delaying action. The biggest problem in the attack, explained the leading battalion commander, Lt. Col. Thomas R. Woodyard, was lack of artillery support. "After the artillery preparation for the jump off," Colonel Woodyard said later, "we received no artillery support because it was considered that our own troops, on the flanks, were too close . . . for safety in firing. "21 Though two attached troops of tanks from the British Sherwood Rangers Yeomanry provided close support, they could not make up entirely for lack of artillery. Within Sueggerath, the Germans were not so easily cowed. Though one company pushed quickly through the village, bypassed strongpoints continued to hold out. As night came, Colonel Woodyard’s battalion still was heavily engaged in Sueggerath. Because the village sits in a depression, Colonel Woodyard wanted to continue to high ground a few hundred yards to the northeast; yet he was concerned that the day’s losses and disorganization had so weakened his battalion that he could not reach that objective alone. Not until near midnight was the regimental commander, Col. Timothy A. Pedley, Jr., able to get another battalion forward to help. An attack by both battalions in the darkness did the job. At the conclusion of this attack, the 333d Infantry still was more than a mile short of the final objective of Wuerm. Nevertheless, the bulk of the Geilenkirchen salient had been eliminated. If the regiment could adjust its positions to tie in with the British to the northwest and with the 334th Infantry to the southeast, the 30 Corps could present a solid and fairly straight front line. Still concerned lest the 15th Panzer Grenadier Division materialize against the 84th Division’s southeastern flank, General Bolling told Colonel Pedley to take precautions against this possibility during the third day, 20 November. In the meantime, the 334th Infantry was to clear the last dogged resistance from Prummern. Both regiments then might renew the attack on the fourth day against Muellendorf, Wuerm, and Beeck. On this fourth day, 21 November, an exercise in frustration began. Through the preceding day and night, rain had fallen intermittently. Early on 21 November it became a downpour that turned the loamy soil of the Wurm valley into a virtual quagmire. Because the road from Sueggerath toward Muellendorf and Wuerm obviously was mined, British tanks supporting the 333d Infantry would have to wade through the mud. Though the tankers tried to use an alternate road along the railroad, debris at a demolished underpass in Sueggerath blocked movement in that direction. That night engineers tackled the underpass in Sueggerath with explosives while artillery officers worked out an elaborate fire plan. To protect infantry and tanks, whose movement in the mud would he snaillike at best, artillery of the 84th Division and the 30 Corps was to lay down a rolling barrage. The barrage was to begin even before the tanks left Sueggerath, because the tankers had several hundred yards of exposed ground to cross before reaching the infantry positions. Sometimes the best-laid battle plans can go awry for the want of a single piece of equipment. That happened on 22 November when a bulldozer failed to arrive to complete the task of clearing the underpass in Sueggerath so that the tanks might move. Not until midafternoon, after the infantry already had jumped off and run into much the same frustration as on the day before, did the tanks get forward. To the relief of all concerned, the tanks were all that was needed. As flame throwers on the Crocodiles went into action, the Germans emerged from the nest of pillboxes that had barred the way, hands high. Three pillboxes fell in rapid succession. intense grazing fire that earlier had denied the pillboxes. As night came, one platoon broke into the village, only to be engulfed without trace in the darkness. At last the infantry dug in about the pillboxes, still a half mile short of Muellendorf. The change from half-hearted to stanch resistance was not confined to the Muellendorf sector alone. On both 21 and 22 November the 43d British Division also encountered opposition which denied the division’s final objectives on the other side of the Wurm River northwest of Muellendorf. Likewise, in the sector of the 334th Infantry, frustration again was the keynote. A one-battalion attack from Prummern against Beeck was repulsed by the same sharp resistance and the same appalling conditions of mud. Though frustrating, the attacks as early as 21 November did reveal an illuminating bit of intelligence information. Prisoner identifications all along the front of the 30 Corps left no doubt that the iron which the Germans had added to their resistance was the 15th Panzer Grenadier Division. Having first employed the panzer grenadiers in counterattack against the XIX Corps, the Germans then had committed most of the division to fixed defense in front of the 84th Division. Concern about the 84th Division’s southeastern flank alleviated by this identification, General Bolling sought permission to reinforce his attack with the regiment of the 102d Division which had been provided three days before for use in event of emergency. General Bolling wanted to send two battalions of this regiment to flank the village of Beeck by seizing high ground on the east and north, while the remaining battalion struck frontally and two battalions of the 84th Division provided fire support. Approval gained, the 102d Division’s 405th Infantry attacked toward Beeck on 22 November, only to discover as had the other regiments that a combination of mud and exposed ground was too much. The fight swung up and down the open slopes between Prummern and Beeck. Though several pillboxes were eliminated and forty Germans captured, no major gain could be registered. The 84th Division’s attack at Muellendorf and Beeck continued through 23 November, but to no avail. At the end of the day, General Gillem directed the 84th to go over to the defensive. For five more days the 84th Division was to hold here while the 113th Cavalry Group gradually took over to maintain contact with the British and while General Gillem prepared his XIII Corps for participation in the final phase of the drive to the Roer. In early plans, the XIII Corps was to have begun to attack on 23 November, but that obviously was illusory in the light of the hard fight experienced by the 84th Division and of the scattered position of the regiments of the 102d Division. As a kind of temporary stalemate settled over this part of the Roer plain, the battlefield was a dreary spectacle. The sun seldom shone. A damp, grayish mist predominated. Sodden by rain, gashed by shells and tank tracks, the beet and cabbage fields were dismal and ugly. Drab enough at the start of the fighting, the villages now were desolate.